We have 8 days to see Munich, Rothenburg ob der Tauber, Fussen (castles) Salzburg, then back to Munich. We've never visited Germany before and are unsure about the best way to travel. We prefer the more scenic routes but need to be somewhat efficient with our time. We get to Munich early in the morning and would not be able to check into a Hotel to rest until late afternoon so we thought we should just head to Rothenburg. Would it be best to rent a car at the airport or take a train this first day to Rothenburg and then rent a car to begin the Romantic Road? We are a little anxious about the autobahn but certainly willing to try it. There seems to be two thoughts on Rothenburg as far as how long to stay. 1 night or 2? More time on the Romantic Road? or in Salzburg area? We are not big on big cities. Rothenburg and Fussen are not easy location to reach by train. You will need to transfer 2 or 3 times. Driving to these locations would be faster and easier. It seems that you fly in and out of Munich. Are the arrival and departure dates included in the 8 days? I would drive to Rothenburg the day I arrive ( 2 nights). Drive to Fussen early in the morning to see the castles (1 night). Drive to Salzburg ( 3 nights with day trips to Munich). Drive to Munich the morning before departure. Depending on what time you leave, you could even drive to the airport from Salzburg the day you leave. Rothenburg deserves at least 2 nights. Why not drop bags at hotel and do a quick tour of Munich before you check in. After a long flight, you don't want to take a train for a 2 hours + ride to Rothenburg from Munich or drive. Take it easy on the first day and look at some areas you can visit in Munich and have lunch before you go to hotel. Thank you! Our arrival and departure days are not included in the 8 days. By the way, we are traveling in May. Which villages are a must see on the RR and which could we skip? "We've never visited Germany before and are unsure about the best way to travel." Generally speaking, the train system is extensive and will get you nearly everywhere, both comfortably and inexpensively. Check out all the train routes in Bavaria (your area of focus.) Most of us first-timers to Germany from North America - including those who've traveled elsewhere in Europe by train - do not quite understand how seamless the transport system is in Germany and reflexively opt for a rental car. Another thing about first-timers... and I try to say this with some measure of respect to Rick Steves... they pay way too much attention to Rick Steves and his go-to places. Bavaria is full of wonderful places. But Rick's main choices are guaranteed to put you in the permanent company of other Americans and other international tourists throughout your trip. For a better look at authentic Germany in your short time of 8 days - and some time around Germans - I suggest you spend half your time in places he does NOT recommend, emphasize, or even mention. "We are not big on big cities." Here are a few places that are Salzburg-sized or smaller and not too far from Munich, places that tend to be off the tourist radar and that Germans themselves value and visit. Maybe 1 or 2 of them could replace something in your current itinerary. With eight days I'd suggest just doing Munich, Nuremberg, Rothenburg odT, and Augsburg as a nice round trip. All of that can be done easily by train. But if you have to do everything on your list, and you're comfortable driving, Munich to Rothenburg odT, to Fussen, to Salzburg, and back to Munich. I think the whole Fussen thing is over-rated, and there are some really good castles out there that don't get over run with tourists. Funny thing is you'll hit more crowds in Fussen and Rothenburg than in Munich. If you haven't purchased airfare yet, I might suggest flying into Frankfurt and outbound from Munich to eliminate doubling back to an airport. We are doing 4 nights in Salzburg, 1 in Innsbruck (Swarovski Kristallwelten), 2 in Hohenschwangau, 2 in Dinkelsbuhl and 3 in the Mossel river valley before flying home from Frankfurt. As there are a few routes to choose from between Munich and Rothenburg, and between Fussen and Salzburg, is there one route that is more scenic than another? A difference of 10 to 15 minutes makes no difference to me. :-) This forum is great, much appreciated! Get off the highway at “Traunstein” exit and head south towards Inzell. Then to Schneizlreuth and to Berchtesgaden. Gorgeous scenery along this route. Done it many, many times and never tire of it. Stop in Ramsau (right turn at Niedermayers Bakery) and see the extremely picturesque church and setting down the road. I lived in Augsburg, Germany, just west of Munich for four years and have been all over Germany, especially Bavaria. Been to Rothenburg on the Tauber twice and you can see the town easily in 4 hours. Not sure why you would stay there two nights. Make sure you do the Romantic Road, at least from Rothenburg down to Garmisch/Fussen. "The first visitors were friends and families of the American soldiers stationed in the large bases in Bavaria and Baden-Württemberg but the idea of the trail from Würzburg to Füssen soon became wildly popular. 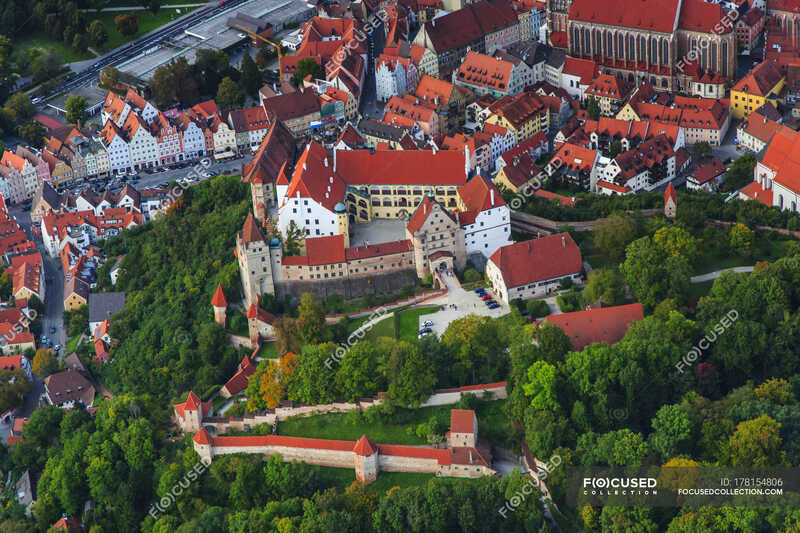 It's not too hard to see the reason for the popularity - despite the modern roots of the idea, the tour combines the historic cities of Würzburg and Augsburg with the three medieval walled towns of Rothenburg ob der Tauber, Dinkelsbühl and Nördlingen, and then finishes off with the tourist highlights of Neuschwanstein Castle and the Alps." Be sure to stop in Dinkelsbuhl and Nordlingen. Both are similar to Rothenberg, especially Dinkelsbuhl. Also, you won't find the crowds there like you find in Rothenberg. Nordlingen is fascinating. The town sits on a meteorite crater with the medieval walls sitting on the rim of the crater. Garmish has three castes nearby, and the most famous is Neuschwanstein Castle, which was built in the 19thCentury and its most notable fame is that Disney seemed to copy it for his parks calling it Cinderella's Castle. It is worth seeing, but for historical value it pales compared to what you find on the Romantic Road, or in Salzburg. "Nordlingen [correct spelling: Nördlingen or Noerdlingen] is fascinating. The town sits on a meteorite crater with the medieval walls sitting on the rim of the crater." This sounds fascinating, indeed, but it isn't true. The crater has a diameter of 20-24 kms and the town of Nördlingen covers only a minor part of it. Besides Nördlingen there are several little towns and villages inside the crater. On nice days you can see the rim of the crater from the top of Nördlingen's famous church tower, the so-called 'Langer Daniel' (Long Daniel).